The author Lauren Willig does something every Friday on her website called The Weekly Round-Up where she posts about the different books she’s been reading throughout the week. Today we’re going to do a version of Lauren Willig’s Round-Up. Let’s call it the Summer Reading Round-Up, shall we? At the beginning of 2018, I did a post chronicling the books that I was looking forward to reading titled New Year’s Reading Resolution. I’ve made quite a dent in my resolution, although I haven’t read through all the books yet. Of course, you will remember The English Wife by Lauren Willig, the giveaway I did earlier this year at Whiskers. Suffice it to say, given the numerous posts I did about it, I very much enjoyed Ms. Willig’s latest offering, particularly all the literary allusions, to which I dedicated an entire post (see posts here and here). Her descriptions are rich, her characters are relatable and real, and her plots are nuanced and complex. If you haven’t picked this one up yet, head to your local library or book shop and stick it in your summer reading/beach bag. 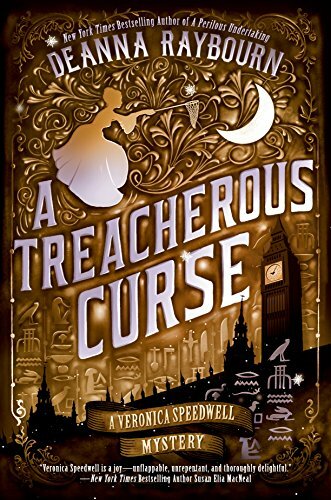 Then there was A Treacherous Curse. Deanna Raybourn is always enjoyable. In fact, I had the immense pleasure of meeting up with her in Georgia when her book was released in January. And, as always, the book was utterly fabulous. If you haven’t read any of Raybourn’s mysteries- whether the Veronica Speedwells or the Lady Julias- I urge you to remedy this oversight. Her characters are modern and well fleshed out, but also retain their integrity within the time period she writes, which would be Victorian England. Not to mention that they are vastly interesting. AND in her latest offering, there was a plethora of Egyptological miscellany. It’s as if she asked me what I wanted her to write about and then wrote the book for me. Honestly, it was a complete pleasure to gobble up. I tried reading through Marina Fiorato’s Beatrice and Benedick, but, alas, it was not my cup of tea, which surprised me as Much Ado About Nothing is one of my favorite Shakespearean plays. I read a few chapters and did not want to continue. Not for any fault of the author, I assure you. The writing was excellent and the plot was solid. It just wasn’t my thing. I think it felt too young, which is exactly what it should be as it was YA. I’m still working my way through Sheralyn Pratt’s Pimpernel. I have a digital copy of this one which could be why it’s slow going. I tend to like actual books that I can hold in my hand. I like the smell of the pages and the turn of them, too. That being said, this novel provides a massively unique take on the Baroness’ original series. I haven’t gotten far enough to see how it will unfold, but I am still quite intrigued and have to applaud Pratt for her ingenuity. As yet, I have not read The Broken Girls. I don’t know what happened to my month of March, but it whisked in and out so swiftly, I completely forgot that Simone St. James’ newest novel had hit shelves. Never fear, I’m holding this one in reserve for October. Her books are simply delicious for the spookiness of All Hallow’s Eve. I am a great fan of Beatriz Williams. While I love all her books, I think my favorite has always been A Hundred Summers (see posts here and here). Well, it was my favorite until I read The Summer Wives. In The Summer Wives, Beatriz Williams does what she is exceptional at: creating characters of rich depth and complexity who possess an intuitive understanding of integrity. The characters of Joseph and Miranda are almost innocent in their approach to life. Even with the harrowing experiences they live through, they are able to maintain that innocence. Williams always touts such innocence and sweetness as worthy. Her heroes and heroines always hold onto this quality. Furthermore, because innocence, gentility, and genuine purity of heart are presented as laudable virtues, when those qualities are betrayed, it makes the traitor all the more villainous. Couple this with the immersion that always occurs in her novels, and The Summer Wives is a slam dunk. Honestly, I could almost smell the stench of sea mingled with lobster cages, and taste the salty breeze on my lips. I am still trying to work my way through C.S. Lewis’s Space Trilogy. I don’t know what it is particularly, as I am a great admirer of his work, but this trilogy has been nearly impossible for me to get into. My husband’s aunt sent us the entire thing as a surprise gift and I really did try. However, I’ve only made it in 50 pages. It might have been the time I was trying to read it, as there were a great many other things occupying my mind. Regardless, I haven’t given up on it. I will read through those books, and, fingers crossed, will come back with an excellent report too. Any of your, dear reader, familiar with these? How did they fare in your estimation? Now, for the books that completely surprised me. This year I discovered two new series: The Jane Hawk Series and The Lady Darby Series. Dean Koontz is a special treat for me. Always. I love that his books take place in California, a place he describes in exquisite detail. I love that his characters are varied and from all sorts of interesting walks of life. And I LOVE that he appreciates the sanctity of life. His books are always about good triumphing over evil. He drives that theme home time and again, showing the cost and the sacrifice such a stance will demand, but also showing how paramount it is that we take such stances in our lives. The manner in which he establishes the nefariousness of his villains is superb. They are evil because of their sheer and unrelenting desire to see all that is good and pure destroyed. He does not hammer this concept down his readers' throats, either. Rather, he weaves a storyline in which his villains' as well as his heroes’ actions maintain the integrity of their characters. Put quite simply, the bad guys do really bad deeds, but those deeds make sense within the fiber of their character. The same goes for the good guys, too. That sort of crafting is not easy, at least, not in my book. However, Koontz pulls it off without a hitch. Furthermore, Koontz's prose is completely on point. I did a blog post last year highlighting why I though he was the King of Metaphor (see post here). Honestly, he can come up with the best images and allusions. AND he does it all without making you feeling like he's writing. They flow as naturally as the river to the sea. The Jane Hawk series (three books now, with another coming out in September) is on par. If you liked his Odd Thomas series, then this one will hit your spot. Although, you might go through moments of unease, where you vow to perfect your bug out bag and live off the grid, free and away from the overarching control of the Brave New World. Now, for something completely different. I mean, Victorian murder mysteries set in Scotland are pretty much on the opposite side of the scale from Orwellian Brave New World type novels. What have you read so far this year that has left a mark?